The fluctuations in temperature, wind and precipitation that occur throughout the growing season in Kansas can be frustrating for gardeners. Although some trees may not respond well to these conditions, native trees can withstand the extremes and require little maintenance. They rarely need water or fertilizer and have built up a resistance to common pests and diseases. A variety of Kansas native trees work well in the home landscape, from small ornamental trees to tall shade trees. The dense, thorny branches of Crataegus mollis, or red hawthorn, reach up to 30 feet tall. In the spring, clusters of white flowers bloom among the large, fuzzy leaves. The branches teem with bright red fruits in late summer through early fall. Leaf diseases may cause early defoliation but this actually contributes to the ornamental value of the tree by providing an open display of the fruits. These diseases do not cause long-term harm to the tree. 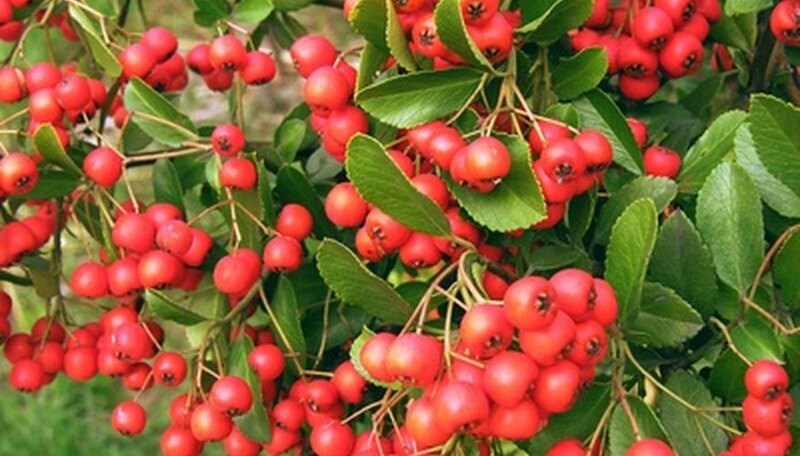 Red hawthorn tolerates drought and most soil conditions but performs poorly in waterlogged soil. Plant red hawthorn in full sun or partial shade. The slow-growing tree known as Carya ovata, or shagbark hickory, features peeling, shaggy bark and reaches up to 80 feet tall. The leaves emerge in spring from attractive buds, followed by inconspicuous flowers. In the fall, the foliage turns bright yellow and thick-shelled nuts appear. The nuts are frequently used in baking and often attract squirrels and chipmunks. Shagbark hickory tolerates most well-drained soils. It will perform best away from patios and regularly used areas of the yard, as disturbance may cause stress for the tree. Falling nuts also produce litter and can cause possible injury. Bur oak, or Quercus macrocarpa, grows wild in prairies and open woodlands. This oak can grow up to 100 feet tall and produces an open, wide crown. The dark green, glossy leaves are pale underneath and grow 7 inches long. Bur oak provides subdued fall color, with its foliage turning light tan. The large acorns, reaching up to 2 inches in diameter, sit inside fringed cups that resemble burs. This long-lived tree tolerates flood, drought and most soil types. The pawpaw tree looks similar to a tropical tree, with its large, thick, drooping leaves that grow up to 1 foot long. Pawpaw, also known as Asimina triloba, grows up to 30 feet in height and features either multiple branches or a single trunk. The reddish brown, three-lobed flowers appear before the foliage in the spring and are unusual but not particularly showy. The edible yellow fruits grow 6 inches long and taste similar to bananas. Plant pawpaw trees in moist, rich soil and either sun or shade. These trees require little attention but need water during periods of drought.